"Santa Monica" redirects here. For other uses, see Santa Monica (disambiguation). Santa Monica was long inhabited by the Tongva people. Santa Monica was called Kecheek in the Tongva language. The first non-indigenous group to set foot in the area was the party of explorer Gaspar de Portolà, who camped near the present-day intersection of Barrington and Ohio Avenues on August 3, 1769. Named after the Christian saint Monica, there are two different accounts of how the city's name came to be. One says it was named in honor of the feast day of Saint Monica (mother of Saint Augustine), but her feast day is May 4. Another version says it was named by Juan Crespí on account of a pair of springs, the Kuruvungna Springs (Serra Springs), that were reminiscent of the tears Saint Monica shed over her son's early impiety. In Los Angeles, several battles were fought by the Californios. Following the Mexican–American War, Mexico signed the Treaty of Guadalupe Hidalgo, which gave Mexicans and Californios living in state certain unalienable rights. 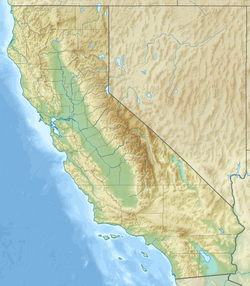 US government sovereignty in California began on February 2, 1848. In the 1870s the Los Angeles and Independence Railroad, connected Santa Monica with Los Angeles, and a wharf out into the bay. The first town hall was a modest 1873 brick building, later a beer hall, and now part of the Santa Monica Hostel. It is Santa Monica's oldest extant structure. 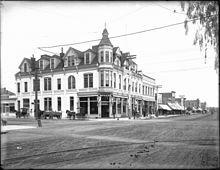 By 1885, the town's first hotel was the Santa Monica Hotel. 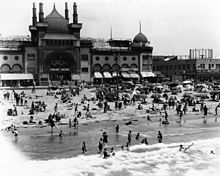 Around the start of the 20th century, a growing population of Asian Americans lived in and around Santa Monica and Venice. A Japanese fishing village was near the Long Wharf while small numbers of Chinese lived or worked in Santa Monica and Venice. The two ethnic minorities were often viewed differently by White Americans who were often well-disposed towards the Japanese but condescending towards the Chinese. The Japanese village fishermen were an integral economic part of the Santa Monica Bay community. Donald Wills Douglas, Sr. built a plant in 1922 at Clover Field (Santa Monica Airport) for the Douglas Aircraft Company. In 1924, four Douglas-built planes took off from Clover Field to attempt the first aerial circumnavigation of the world. Two planes returned after covering 27,553 miles (44,342 km) in 175 days, and were greeted on their return September 23, 1924, by a crowd of 200,000 (generously estimated). The Douglas Company (later McDonnell Douglas) kept facilities in the city until the 1960s. The Great Depression hit Santa Monica deeply. One report gives citywide employment in 1933 of just 1,000. Hotels and office building owners went bankrupt. In the 1930s, corruption infected Santa Monica (along with neighboring Los Angeles). The federal Works Project Administration helped build several buildings, most notably City Hall. The main Post Office and Barnum Hall (Santa Monica High School auditorium) were also among other WPA projects. Douglas's business grew astronomically with the onset of World War II, employing as many as 44,000 people in 1943. To defend against air attack, set designers from the Warner Brothers Studios prepared elaborate camouflage that disguised the factory and airfield. The RAND Corporation began as a project of the Douglas Company in 1945, and spun off into an independent think tank on May 14, 1948. RAND eventually acquired a 15-acre (61,000 m²) campus between the Civic Center and the pier entrance. The Santa Monica Looff Hippodrome (carousel) is a National Historic Landmark. It sits on the Santa Monica Pier, which was built in 1909. The La Monica Ballroom on the pier was once the largest ballroom in the US and the source for many New Year's Eve national network broadcasts. The Santa Monica Civic Auditorium was an important music venue for several decades and hosted the Academy Awards in the 1960s. McCabe's Guitar Shop is a leading acoustic performance space as well as retail outlet. Bergamot Station is a city-owned art gallery compound that includes the Santa Monica Museum of Art. The city is also home to the California Heritage Museum and the Angels Attic dollhouse and toy museum. The New West Symphony is the resident orchestra of Barnum Hall. They are also resident orchestra of the Oxnard Performing Arts Center and the Thousand Oaks Civic Arts Plaza. 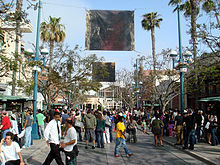 Santa Monica has three main shopping districts: Montana Avenue on the north side, the Downtown District in the city's core, and Main Street on the south end. Each has its own unique feel and personality. Montana Avenue is a stretch of luxury boutique stores, restaurants, and small offices that generally features more upscale shopping. The Main Street district offers an eclectic mix of clothing, restaurants, and other specialty retail. Santa Monica has several local newspapers including Santa Monica Daily Press, Santa Monica Mirror, Santa Monica Star, and Santa Monica Observer. Santa Monica has a coastal Mediterranean climate (Köppen Csb). Santa Monica enjoys an average of 310 days of sunshine a year. It is in USDA plant hardiness zone 11a. Because of its location, nestled on the vast and open Santa Monica Bay, morning fog is a common phenomenon in May, June and early July (caused by ocean temperature variations and currents). Like other inhabitants of the greater Los Angeles area, residents have a particular terminology for this phenomenon: the "May Gray" and the "June Gloom". Overcast skies are common during June mornings, but usually the strong sun burns the fog off by noon. In the late winter/early summer, daily fog is a phenomenon too. It happens suddenly and it may last some hours or past sunset time. Nonetheless, it will sometimes stay cloudy and cool all day during June, even as other parts of the Los Angeles area enjoy sunny skies and warmer temperatures. At times, the sun can be shining east of 20th Street, while the beach area is overcast. As a general rule, the beach temperature is from 5 to 10 degrees Fahrenheit (3 to 6 degrees Celsius) cooler than it is inland during summer days, and 5–10 degrees warmer during winter nights. It is also in September highest temperatures tend to be reached. It is winter, however, when the hot, dry winds of the Santa Anas are most common. In contrast, temperatures exceeding 10 degrees below average are rare. Santa Monica usually enjoys cool breezes blowing in from the ocean, which tend to keep the air fresh and clean. Therefore, smog is less of a problem for Santa Monica than elsewhere around Los Angeles. However, in the autumn months of September through November, the Santa Ana winds will sometimes blow from the east, bringing smoggy and hot inland air to the beaches. Santa Monica is one of the most environmentally activist municipalities in the nation. The city first proposed its Sustainable City Plan in 1992 and in 1994, was one of the first cities in the nation to formally adopt a comprehensive sustainability plan, setting waste reduction and water conservation policies for both public and private sector through its Office of Sustainability and the Environment. Eighty-two percent of the city's public works vehicles now run on alternative fuels, including nearly 100% of the municipal bus system, making it among the largest such fleets in the country. Santa Monica fleet vehicles and buses now source their natural gas from Redeem, a Southern California-based supplier of renewable and sustainable natural gas obtained from non-fracked methane biogas generated from organic landfill waste. Santa Monica has adopted a Community Energy Independence Initiative, with a goal of achieving complete energy independence by 2020 (vs. California's already ambitious 33% renewables goal). In the last 15 years, greenhouse gas emissions have been cut citywide by nearly 10% relative to 1990 levels, with further reductions being planned by the Office of Sustainability. An urban runoff facility (SMURFF), the first of its kind in the US, catches and treats 3.5 million US gallons (13,000 m3) of water each week that would otherwise flow into the bay via storm-drains and sells it back to end-users within the city for reuse as gray-water, while bio-swales throughout the city allow rainwater to percolate into and replenish the groundwater supply. The groundwater supply, in turn, plays an important role in the city's Sustainable Water Master Plan, whereby Santa Monica has set a goal of attaining 100% water independence by 2020. The city has numerous programs designed to promote water conservation among residents, including a rebate of $1.50 per square foot for those who convert water intensive lawns to more local drought-tolerant gardens that require less water. Santa Monica has also instituted a green building-code whereby merely constructing to code automatically renders a building equivalent to the US Green Building Council's LEED Silver standards. The city's Main Library, for example, is one of many LEED certified or LEED equivalent buildings in the city. It is built over a 200,000 gallon cistern that collects filtered stormwater from the roof. The water is used for landscape irrigation. Since 2009, Santa Monica has been developing the Zero Waste Strategic Operations Plan by which the city will set a goal of diverting at least 95% of all waste away from landfills, and toward recycling and composting, by 2030. The plan includes a food waste composting program, which diverts 3 million pounds of restaurant food waste away from landfills annually. Currently, 77% of all solid waste produced citywide is diverted from landfills. The city is also in the process of implementing a 5-year and 20 year Bike Action Plan with a goal of attaining 14 to 35% bicycle transportation mode share by 2030 through the installation of enhanced bicycle infrastructure throughout the city. Other environmentally focused initiatives include curbside recycling, curbside composting bins (in addition to trash, yard-waste, and recycle bins), farmers' markets, community gardens, garden-share, an urban forest initiative, a hazardous materials home-collection service, green business certification, a municipal bus system, and the Metro light rail Expo Line (replacing the former Pacific Electric Santa Monica Air Line last operated in 1953). Santa Monica's population has grown from 417 in 1880 to 89,736 in 2010. The 2010 United States Census reported Santa Monica had a population of 89,736. The population density was 10,662.6 people per square mile (4,116.9/km²). The racial makeup of Santa Monica was 69,663 (77.6%) White (70.1% Non-Hispanic White), 3,526 (3.9%) African American, 338 (0.4%) Native American, 8,053 (9.0%) Asian, 124 (0.1%) Pacific Islander, 4,047 (4.5%) from other races, and 3,985 (4.4%) from two or more races. Hispanic or Latino of any race were 11,716 persons (13.1%). The Census reported 87,610 people (97.6% of the population) lived in households, 1,299 (1.4%) lived in non-institutionalized group quarters, and 827 (0.9%) were institutionalized. The population was spread out with 12,580 people (14.0%) under the age of 18, 6,442 people (7.2%) aged 18 to 24, 32,552 people (36.3%) aged 25 to 44, 24,746 people (27.6%) aged 45 to 64, and 13,416 people (15.0%) who were 65 years of age or older. The median age was 40.4 years. For every 100 females, there were 93.2 males. For every 100 females age 18 and over, there were 91.2 males. According to a 2009 estimate, the median income for a household in the city is $71,095, and the median income for a family is $109,410. Males have a median income of $55,689 versus $42,948 for females. The per capita income for the city is $42,874. 10.4% of the population and 5.4% of families are below the poverty line. Out of the total population, 9.9% of those under the age of 18 and 10.2% of those 65 and older are living below the poverty line. In 2006, Santa Monica voters passed "Measure Y" with a 65% majority, which moved the issuance of citations for marijuana smoking to the bottom of the police priority list. A 2009 study by the Santa Monica Daily Press showed since the law took effect in 2007, the Santa Monica Police had "not issued any citations for offenses involving the adult, personal use of marijuana inside private residences." In June 2011, the Boston gangster Whitey Bulger was arrested in Santa Monica after being a fugitive for 16 years. He had been living in the area for 15 years. A shooting in Santa Monica in 2013 left six (including the perpetrator) dead and five more injured. The Pico neighborhood of Santa Monica (south of the Santa Monica Freeway) experiences some gang activity. The city estimates there are about 50 gang members based in Santa Monica, although some community organizers dispute this claim. Gang activity has been prevalent for decades in the Pico neighborhood. In October 1998, alleged Culver City 13 gang member Omar Sevilla, 21, of Culver City was killed. A couple of hours after the shooting of Sevilla, German tourist Horst Fietze was killed. Several days later Juan Martin Campos, age 23, a Santa Monica city employee, was shot and killed. Police believe this was a retaliatory killing in response to the death of Omar Sevilla. Less than twenty-four hours later, Javier Cruz was wounded in a drive-by shooting outside his home on 17th and Michigan. Aside from the rivalry with the Culver City gang, gang members also feud with the Venice and West Los Angeles gangs. 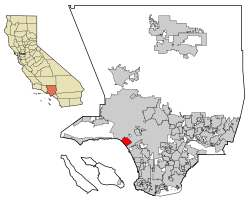 The main rivals in these regions include Venice 13, Graveyard Gangster Crips, Hell's Vandidos and Venice Shoreline Crips gangs in the Oakwood area of Venice, California. The Santa Monica-Malibu Unified School District provides public education at the elementary and secondary levels. In addition to the traditional model of early education school houses, SMASH (Santa Monica Alternative School House) is "a K-8 public school of choice with team teachers and multi-aged classrooms". The district maintains three public middle schools in Santa Monica: John Adams Middle School, Lincoln Middle School and SMASH. The district maintains three high schools in Santa Monica: Olympic High School, Malibu High School and Santa Monica High School. Asahi Gakuen, a weekend Japanese supplementary school system, operates its Santa Monica campus (サンタモニカ校･高等部 Santamonika-kō kōtōbu) at Webster Middle in the Sawtelle neighborhood of Los Angeles. All high school classes in the Asahi Gakuen system are held at the Santa Monica campus. As of 1986, students take buses from as far away as Orange County to go to the high school classes of the Santa Monica campus. Santa Monica College is a community college founded in 1929. Many SMC graduates transfer to the University of California system. It occupies 35 acres (14 hectares) and enrolls 30,000 students annually. The Frederick S. Pardee RAND Graduate School, associated with the RAND Corporation, is the U.S.'s largest producer of public policy PhDs. The Art Institute of California – Los Angeles is also in Santa Monica near the Santa Monica Airport. Universities and colleges within a 22-mile (35 km) radius from Santa Monica include Santa Monica College, Antioch University Los Angeles, Loyola Marymount University, Mount St. Mary's University, Pepperdine University, California State University, Northridge, California State University, Los Angeles, UCLA, USC, West Los Angeles College, California Institute of Technology (Caltech), Occidental College (Oxy), Los Angeles City College, Los Angeles Southwest College, Los Angeles Valley College, and Emperor's College of Traditional Oriental Medicine. The Santa Monica Public Library consists of a Main Library in the downtown area, plus four neighborhood branches: Fairview, Montana Avenue, Ocean Park, and Pico Boulevard. Santa Monica has a bike action plan and recently launched a bicycle sharing system in November 2015. The city is traversed by the Marvin Braude Bike Trail. Santa Monica has received the Bicycle Friendly Community Award (Bronze in 2009, Silver in 2013) by the League of American Bicyclists. Local bicycle advocacy organizations include Santa Monica Spoke, a local chapter of the Los Angeles County Bicycle Coalition. Santa Monica is thought to be one of the leaders for bicycle infrastructure and programming in Los Angeles County. In terms of number of bicycle accidents, Santa Monica ranks as one of the worst (#2) out of 102 California cities with population 50,000–100,000, a ranking consistent with the city's composite ranking. In 2007 and 2008, local police cracked down on Santa Monica Critical Mass rides that had become controversial, putting a damper on the tradition. In August 2018, Santa Monica issued permits to Bird, Lime, Lyft, and Jump Bikes to operate dockless scooter-sharing systems in the city. 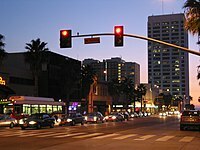 The city of Santa Monica is also served by the Los Angeles County Metropolitan Transportation Authority's (Metro) bus lines. Metro also complements Big Blue service, as when Big Blue routes are not operational overnight, Metro buses make many Big Blue Bus stops, in addition to MTA stops. Design and construction on the 6.6-mile extension (10.6 km) of the Expo Line from Culver City to Santa Monica started in September 2011, with service beginning on May 20, 2016. Santa Monica Metro stations include 26th Street/Bergamot, 17th Street/Santa Monica College, and Downtown Santa Monica. Travel time between the downtown Santa Monica and the downtown Los Angeles termini is approximately 47 minutes. Historical aspects of the Expo line route are noteworthy. It uses the former Los Angeles region's electric interurban Pacific Electric Railway's right-of-way that ran from the Exposition Park area of Los Angeles to Santa Monica. This route was called the Santa Monica Air Line and provided electric-powered freight and passenger service between Los Angeles and Santa Monica beginning in the 1920s. Passenger service was discontinued in 1953, but diesel-powered freight deliveries to warehouses along the route continued until March 11, 1988. The abandonment of the line spurred future transportation considerations and concerns within the community, and the entire right-of-way was purchased from Southern Pacific by Los Angeles Metropolitan Transportation Authority. The line was built in 1875 as the steam-powered Los Angeles and Independence Railroad to bring mining ore to ships in Santa Monica harbor and as a passenger excursion train to the beach. Since the mid-1980s, various proposals have been made to extend the Purple Line subway to Santa Monica under Wilshire Boulevard. There are no current plans to complete the "subway to the sea," an estimated $5 billion project. Santa Monica has a municipal wireless network which provides several free city Wi-Fi hotspots distributed around the City. Santa Monica is governed by the Santa Monica City Council, a Council-Manager governing body with seven members elected at-large. The mayor is Ted Winterer, and the Mayor Pro Tempore is Gleam Davis. The other five current council members are Sue Himmelrich, Kevin McKeown, Tony Vazquez, Pam O'Connor, and Terry O'Day. Santa Monica is home to the headquarters of many notable businesses, including Hulu, Universal Music Group, Illumination Entertainment, Saban Capital Group, Miramax, Lionsgate Films, the RAND Corporation, Beachbody, and Macerich. Atlantic Aviation is at the Santa Monica Airport. National Public Radio member station KCRW is at the Santa Monica College campus. Riot Games, the creators of League of Legends is just outside the eastern city limit. Fatburger's headquarters are in Santa Monica. TOMS Shoes has its headquarters in Santa Monica. VCA Animal Hospitals is just outside the eastern city limit. Recently, Santa Monica has emerged as the center of the Los Angeles region called Silicon Beach, and serves as the home of hundreds of venture capital funded startup companies. The men's and women's marathon ran through parts of Santa Monica during the 1984 Summer Olympics. The Santa Monica Track Club has many prominent track athletes, including many Olympic gold medalists. Santa Monica is the home to Southern California Aquatics, which was founded by Olympic swimmer Clay Evans and Bonnie Adair. Santa Monica is also home to the Santa Monica Rugby Club, a semi-professional team that competes in the Pacific Rugby Premiership, the highest-level rugby union club competition in the United States. During the 2028 Summer Olympics. Santa Monica will host beach volleyball and surfing. Hundreds of movies have been shot or set in part within the city of Santa Monica. One of the oldest exterior shots in Santa Monica is Buster Keaton's Spite Marriage (1929) which shows much of 2nd Street. The comedy It's a Mad, Mad, Mad, Mad World (1963) included several scenes shot in Santa Monica, including those along the California Incline, which led to the movie's treasure spot, "The Big W". The Sylvester Stallone film Rocky III (1982) shows Rocky Balboa and Apollo Creed training to fight Clubber Lang by running on the Santa Monica Beach, and Stallone's Demolition Man (1993) includes Santa Monica settings. In Pee-wee's Big Adventure (1985), the theft of Pee-wee's bike occurs on the Third Street Promenade. Henry Jaglom's indie Someone to Love (1987), the last film in which Orson Welles appeared, takes place in Santa Monica's venerable Mayfair Theatre. Heathers (1989) used Santa Monica's John Adams Middle School for many exterior shots. 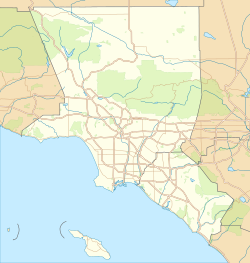 The Truth About Cats & Dogs (1996) is set entirely in Santa Monica, particularly the Palisades Park area, and features a radio station that resembles KCRW at Santa Monica College. 17 Again (2009) was shot at Samohi. Other films that show significant exterior shots of Santa Monica include Fletch (1985), Species (1995), Get Shorty (1995), and Ocean's Eleven (2001). Richard Rossi's biopic Aimee Semple McPherson opens and closes at the beach in Santa Monica. Iron Man features the Santa Monica pier and surrounding communities as Tony Stark tests his experimental flight suit. The Santa Monica Pier is shown in many films, including They Shoot Horses, Don't They? (1969), The Sting (1973), Ruthless People (1986), Beverly Hills Cop III (1994), Clean Slate (1994), Forrest Gump (1994), The Net (1995), Love Stinks (1999), Cellular (2004), The Cutting Edge: Going for the Gold (2006), Iron Man (2008) and Hannah Montana: The Movie (2009). A number of television series have been set in Santa Monica, including Baywatch, Three's Company, Pacific Blue, and Private Practice. 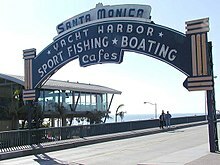 The Santa Monica pier is shown in the main theme of CBS series NCIS: Los Angeles. In Buffy the Vampire Slayer, the main exterior set of the town of Sunnydale, including the infamous "sun sign", was in Santa Monica in a lot on Olympic Boulevard. The films The Doors (1991) and Speed (1994) featured vehicles from Santa Monica's Big Blue Bus line, relative to the eras depicted in the films. The main character from Edgar Rice Burroughs' The Land That Time Forgot was a shipbuilder from Santa Monica. Tennessee Williams lived (while working at MGM Studios) in a hotel on Ocean Avenue in the 1940s. At that location he wrote The Glass Menagerie. His short story titled "The Mattress by the Tomato Patch" was set near Santa Monica Beach and mentions the clock visible in much of the city, high up on The Broadway Building, on Broadway near 2nd Street. 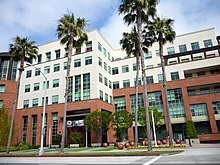 Universal Music Group is based in Santa Monica. Several of its labels such as Aftermath Entertainment (started by Dr. Dre), Interscope (started by Jimmy Iovine), A&M Records, Geffen Records, Shady Records, and G-Unit Records (created by 50 Cent & Sha Money XL) are based in Santa Monica, CA. One of the few songs musical satirist Tom Lehrer has recorded since the 1970s is a tribute to the holidays of the Jewish calendar entitled "I'm Spending Hanukkah in Santa Monica". In 1948, bandleader Kay Kyser released a 78 record of the novelty song "When Veronica Plays the Harmonica (Down at the Pier in Santa Monica)". The System Of A Down song "Lost in Hollywood" mentions the city. The band Linkin Park is named in homage to Santa Monica's Lincoln Park (now called Christine Emerson Reed Park). 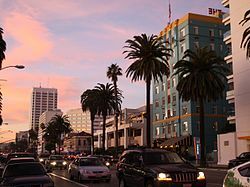 Santa Monica is featured in the video games Driver (1999), True Crime: Streets of LA (2003), Vampire: The Masquerade – Bloodlines (2004), Grand Theft Auto San Andreas (2004) as a fictional district - Santa Maria Beach, Destroy All Humans! (2004), Tony Hawk's American Wasteland (2005), L.A. Rush (2005), Midnight Club: Los Angeles (2008), Cars Race-O-Rama (2009) as a fictional city - Santa Carburera, Grand Theft Auto V (2013) as a fictional district – Del Perro, Call of Duty: Ghosts (2013) as a fictional U.S. military base – Fort Santa Monica, The Crew (2014) and Need for Speed (2015). ^ Archibald, Ashley (April 26, 2013). "Report: SaMo air quality some of the best in SoCal". Daily Press. Santa Monica, California. Retrieved January 5, 2015. ^ Simpson, David Mark (June 3, 2015). "The mystery of Santa Monica's city motto". Santa Monica Daily Press. ^ "California Cities by Incorporation Date". California Association of Local Agency Formation Commissions. Archived from the original (Microsoft Word) on February 21, 2013. Retrieved August 25, 2014. ^ "Charter of the City of Santa Monica". Quality Code Publishing. Retrieved November 4, 2014. ^ a b "Santa Monica City Council". City of Santa Monica. Retrieved March 14, 2017. ^ "Santa Monica". Geographic Names Information System. United States Geological Survey. Retrieved October 20, 2014. ^ "Santa Monica (city) QuickFacts". United States Census Bureau. Retrieved March 15, 2015. ^ Begley, Sarah (December 10, 2015). "The Most Popular Places to Check In on Facebook in 2015". Time. Retrieved January 27, 2016. ^ "Water and Power Associates". waterandpower.org. ^ Fogelson, Robert M. (1993). The fragmented metropolis: Los Angeles, 1850–1930. Berkeley: University of California Press. p. 200. ISBN 978-0-520-08230-4. ^ Ben Tracy (February 18, 2009). "Santa Monica's Disputed Steps". CBS News TV report. Retrieved February 24, 2010. ^ "Weatherbase: Historical Weather for Los Angeles, California, United States of America". Weatherbase.com. Retrieved August 13, 2009. 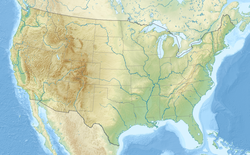 ^ "Interactive USDA Gardening and Plant Hardiness Zone Map for California". Plantmaps.com. Retrieved October 31, 2016. ^ "Santa Barbara.com: June Gloom". SantaBarbara.com. Retrieved August 13, 2009. ^ "NOAA Santa Monica Climate Normals". National Oceanic and Atmospheric Administration. ^ "Sustainable Santa Monica". Retrieved May 24, 2016. ^ "Big Blue Bus, Fueling a Renewable Future One Bus at a Time - Clean Energy Fuels". Clean Energy Fuels. July 16, 2015. Retrieved May 24, 2016. ^ "Santa Monica Office of Sustainability and the Environment: Solar Santa Monica". Retrieved May 24, 2016. ^ a b c "Santa Monica CA - Visitor Information, Hotels, Dining" (PDF). Santa Monica. Retrieved May 24, 2016. ^ "Santa Monica OSE - Rules & Regulations". Retrieved May 24, 2016. ^ "Taking the green out of green building certification". Santa Monica Daily Press. March 12, 2014. Retrieved May 24, 2016. ^ "Zero Waste Strategic Operations Plan - City of Santa Monica". Retrieved May 24, 2016. ^ "Action plan" (PDF). nelsonnygaard.com. 2014. ^ "The greenest US cities". City Mayors. April 27, 2006. Retrieved June 13, 2012. ^ "Environmental Programs Division (EPD) – City of Santa Monica". Smgov.net. Retrieved June 13, 2012. ^ "Santa Monica, California". City-Data.com. Retrieved June 13, 2012. ^ "2010 Census Interactive Population Search: CA – Santa Monica city". U.S. Census Bureau. Retrieved July 12, 2014. ^ a b "Santa Monica (city) QuickFacts". United States Census Bureau. Retrieved September 27, 2014. ^ "CNN Money – 25 Most Educated Cities". Money.cnn.com. Archived from the original on May 11, 2012. Retrieved June 13, 2012. ^ "Santa Monica city, California – Fact Sheet – American FactFinder". Factfinder.census.gov. Retrieved June 13, 2012. ^ a b "Santa Monica CA Crime Statistics (2006 Crime Data)". Retrieved August 25, 2009. ^ a b "Crime Statistics for Santa Monica". Retrieved August 25, 2009. ^ Schley, Reeve T. (September 25, 2002). "Santa Monica Crime Rate Is Highest in Los Angeles County". Santa Monica Mirror. Archived from the original on October 3, 2002. Retrieved August 25, 2009. ^ "Sustainable City Progress Report". Retrieved August 25, 2009. ^ "Measure Y: Lowest Enforcement Priority for Adult, Personal Use of Marijuana City of Santa Monica". Retrieved August 25, 2009. ^ Emma Trotter (July 31, 2009). "Two years of toking it up". Santa Monica Daily Press. Archived from the original on July 29, 2012. Retrieved August 25, 2009. ^ "Police Chief Calls for Regional Approach to Gang Violence". Surfsantamonica.com. Retrieved June 13, 2012. ^ Don Terry (October 20, 1998). "Death of gangster Omar Sevilla". New York Times. Retrieved June 13, 2012. ^ "NBC Los Angeles report on the capture of Fietze's killer". Nbclosangeles.com. Retrieved June 13, 2012. ^ "Gang Bullets Pierce Santa Monica's Image". Los Angeles Times. October 29, 1998. Retrieved June 13, 2012. ^ "Violence in Pico". Surfsantamonica.com. Retrieved June 13, 2012. ^ "Police Chief to Address Public Safety Concerns". Los Angeles Times. October 21, 1998. Retrieved September 22, 2011. ^ "'Gangster's Paradise Lost'". Streetgangs.com. October 27, 1998. Archived from the original on January 11, 2013. Retrieved June 13, 2012. ^ Santa Monica Alternative School House Curriculum, SMASH Vision Statement". Retrieved May 11, 2011. ^ a b c http://www.smmusd.org/ SMMUSD. Retrieved May 11, 2011. ^ "LCA Saints - The Lighthouse Christian Academy in Santa Monica CA". The Lighthouse Christian Academy in Santa Monica CA. ^ "Saint Anne School". Saint Anne School. Retrieved June 13, 2012. ^ "サンタモニカ校･高等部." Asahi Gakuen. Retrieved on March 30, 2014. "DANIEL WEBSTER MIDDLE SCHOOL 11330 W. Graham Place, Los Angeles, CA 90064 "
^ "Mapping LA: Sawtelle." Los Angeles Times. Retrieved on May 9, 2014. ^ Puig, Claudia. "'School of the Rising Sun' : Surroundings Are American but Classes, Traditions Are Strictly Japanese." Los Angeles Times. November 13, 1986. p. 1. Retrieved on March 30, 2014. ^ "Santa Monica Bike Action Plan". City of Santa Monica. ^ "Bikeshare is coming to Santa Monica!". City of Santa Monica. ^ "Santa Monica". The League of American Bicyclists. May 24, 2013. ^ "Los Angeles County Bicycle Coalition". Los Angeles County Bicycle Coalition. ^ Hymon, Steve (May 17, 2017). "Are the pedals of change in Los Angeles County gaining momentum?". The Source. Retrieved October 14, 2017. ^ "OTS Collision Rankings". California Office of Traffic Safety. ^ "Critical Mass bike ride may be at braking point". Los Angeles Times. December 7, 2007. Retrieved March 7, 2015. ^ Clark, Kate (August 30, 2018). "Santa Monica will allow Lime, Bird, Lyft and JUMP to operate e-scooters". TechCrunch. Oath Inc. Retrieved August 30, 2018. ^ "Santa Monica Introduces Electric Zero Truck Into City Fleet: #evworld". Evworld.com. June 21, 2009. Retrieved June 13, 2012. ^ "Santa Monica Air Line". Electric Railway Historical Association of Southern California. ^ Morgenthaler, Anne (March 14, 1988). "END OF THE LINE—The last train out of SM blows a final whistle". Santa Monica Outlook. ^ "Ambulance Transportation". Santa Monica Fire Department. Santa Monica Fire Department. Retrieved June 13, 2012. ^ "California's 33rd Congressional District - Representatives & District Map". Civic Impulse, LLC. Retrieved September 29, 2014. ^ Ericksen, Olin. "Airport Commission Gives New Operator Thumbs Up, Despite Fears Jet Traffic Will Rise". The Lookout. Retrieved June 13, 2012. ^ Makuch, Eddie (April 23, 2013). 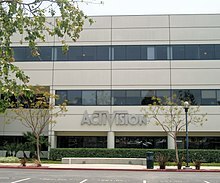 "Star Citizen dev opens new office". GameSpot. CBS Interactive. Archived from the original on November 3, 2014. Retrieved November 22, 2014. ^ "Time Line". Archived from the original on June 4, 2004. Retrieved April 15, 2017. . Naughty Dog. June 4, 2004. Retrieved on May 5, 2010. ^ "Company Profile for PUBG Corporation". Business Wire. Retrieved February 6, 2019. ^ "Contact Archived February 2, 2010, at the Wayback Machine." Fatburger. Retrieved on March 5, 2010. ^ "Contact VCA". Retrieved February 6, 2019. 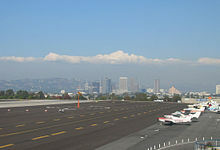 ^ "Airport History - SMO: Santa Monica Municipal Airport". www.smgov.net. Retrieved January 25, 2017. ^ "MySpace company and contact information". ^ "Corporate Information". Archived from the original on October 6, 2000. CS1 maint: BOT: original-url status unknown (link). Metro-Goldwyn-Mayer. October 6, 2000. Retrieved on February 6, 2012. "Corporate Headquarters Metro-Goldwyn-Mayer Inc. 2500 Broadway Street Santa Monica, CA 90404-3061"
^ "Advertising and Sponsorship Information". Archived from the original on December 19, 1996. CS1 maint: BOT: original-url status unknown (link). GeoCities. December 19, 1996. Retrieved on April 30, 2009. ^ Ungerleider, Neal (October 31, 2014). "Why A Subway-Building Binge Could Transform L.A.'s Tech Culture". Fast Company. Retrieved December 28, 2015. ^ "City of Santa Monica CAFR" (PDF). 1.smgov.net. Retrieved July 19, 2014. ^ 1984 Summer Olympics official report. Archived November 2, 2010, at the Wayback Machine Volume 1. Part 1. pp. 97–98. ^ "IMDb: Most Popular Titles With Location Matching "Santa Monica, California, USA"". IMDb. Retrieved May 24, 2016. ^ Martino, Alison (August 28, 2014). "Third Street Promenade Before the Gap Even Existed". CityThink. Los Angeles Magazine. Retrieved February 6, 2019. ^ Hiney, Tom (1999). Raymond Chandler. Grove Press. p. 92. ISBN 978-0-8021-3637-4. ^ "Weezer - Hash Pipe Lyrics | MetroLyrics". www.metrolyrics.com. Retrieved October 10, 2018. ^ "System Of A Down – Lost In Hollywood Lyrics". Metrolyrics.com. Retrieved June 13, 2012. ^ "Dedication Ceremony for Park to Be Held Sunday". Los Angeles Times. June 13, 1998. Retrieved February 6, 2019. Wikimedia Commons has media related to Santa Monica, California. Wikisource has the text of the 1921 Collier's Encyclopedia article Santa Monica.